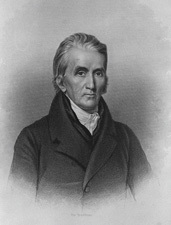 HILLHOUSE, James, (son of William Hillhouse), a Representative and a Senator from Connecticut; born in Montville, Conn., October 20, 1754; attended the Hopkins Grammar School, New Haven, Conn., and graduated from Yale College in 1773; studied law; admitted to the bar in 1775 and commenced practice in New Haven, Conn.; served in the Revolutionary War and in 1779 was captain of the Governors foot guards when New Haven was invaded by the British; member, State house of representatives 1780-1785; chosen as a delegate to the Continental Congress in 1786 and 1788 but did not attend; member, State council 1789-1790; elected to the Second, Third, and Fourth Congresses and served from March 4, 1791, until his resignation in the fall of 1796, having been elected to the United States Senate on May 18, 1796, to fill the vacancy caused by the resignation of Oliver Ellsworth; reelected in 1797, 1803, and 1809, and served from May 18, 1796, until June 10, 1810, when he resigned; served as President pro tempore of the Senate during the Sixth Congress; member of the Hartford convention in 1814; treasurer of Yale College 1782-1832; died in New Haven, Conn., December 29, 1832; interment in Grove Street Cemetery. Dictionary of American Biography; Bacon, Leonard. Sketch of the Life and Public Services of Hon. James Hillhouse of New Haven: With a Notice of His Son, Augustus Lucas Hillhouse. New Haven: n.p., 1860.